I know I haven't talked about how my 5K went, but you can see by this post I'm still alive! This week has been especially stressful so just bear with me as I get through it. So today I'm giving you a book review for a holiday book but it's so great you'll want to start it early. 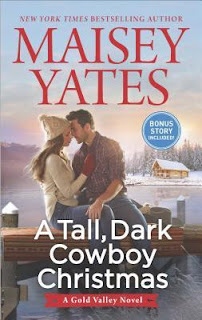 I am such a Maisey Yates fan so you know when I saw this come up for review I was all over it! I've read others in her Gold Valley series and I really have enjoyed them so I love that she made this holiday book a part of that series. You don't need to read the rest of the books to enjoy this, it's fully a stand alone. If you're fans of the rest of the series you see cameos of previous characters so that's kind of nice. In this book we have Grant, who is basically a functioning alcoholic since the death of his wife/high school sweetheart. He gets the pity of people around town and that drives him crazy so he hasn't pursued relationships ever since. Enter McKenna, a woman with no ties to anything and only the contents of her backpack to her name, but she's in Gold Valley to hopefully find her birth father. She takes refuge in an abandoned cabin and Grant finds her. Instead of treating her like an unwanted criminal, the Dodge family take her in. She starts work on the ranch and they give her use of one of the cabins which is the nicest place she's stayed in for as long as she can remember. The best part of this is that you know these two are going to end up together and they both need each other. They are both a little bitchy, for lack of a better word, and they get on each other's nerves, constantly snipping back and forth. They both need love and to be cared for in different ways and they can give that to each other... if only they can stop barking long enough to see it. Overall? I'm giving this one 5 stars. Honestly. I really love Maisey Yates because she gives you a story that grabs at your heart strings, throws in some fun romance, and brings it all together for a great ending. This book all comes around Christmas so it adds another layer of Hallmark movie goodness that makes me love it even more. I really liked both characters because independently they have pretty tragic back stories, but together they make a pretty great couple and you can see it early on. This might be the holiday book I recommend the most, you guys. Get it now while it's still in stock! I’ve never read anything from Yates even though I feel like I see her books *a lot. * I like the fact that it’s a stand-alone type series. And I’m kind of a sucker for a grieving character to find a second chance at love and happiness. I’ll have to check this one out.